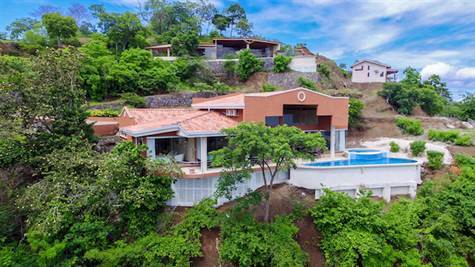 Located in the desirable Beach Community of Playa Hermosa, a Blue Flag awarded beach. Breathtaking ocean view home, two master suites, three bedrooms total, three bathrooms, massive great room with high vaulted wooden teak ceilings, private pool with water fall, large jacuzzi, huge kitchen with tons of cabinet and storage space, breakfast island, wet bar, air conditioning throughout, washer dryer room, owners closet, walk in closets, bathtubs, fully furnished. Perfect for a second home and rental income property. An unbelievable value.